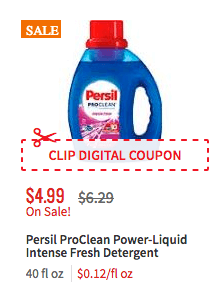 New $2/1 Persil Laundry Detergent Coupon – $0.99 at ShopRite & More! Through 9/22, ShopRite has the Persil Laundry Detergent, 40oz on sale for $4.99 and there is a Save $2.00 on ONE (1) Persil ProClean Power-Liquid Laundry Detergent (excludes 6 loads or less trial/travel sizes), ShopRite eCoupon available to clip making this $0.99 after stacked offers! Extra 30% off Kate Spade + Free Shipping!